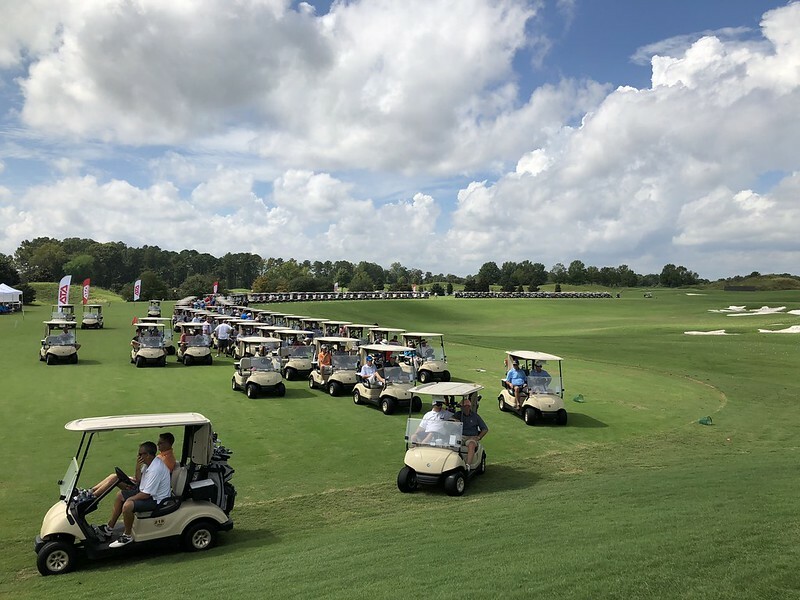 Earlier this week, the Alabama Trucking Association held its annual ATA Golf Classic at the gorgeous Robert Trent Jones Capitol Hill Course in Prattville, Ala. The event’s mission is to raise funds for ATA’s political action committee, TRUK PAC, which supports political candidates in local and state elections. Spearheaded by event Chairman Nic Balanis of ServisFirst Bank, and his finance committee, this year’s tournament raised more than $268,600, surpassing all previous Classics in terms of money raised and participation. The tournament drew 144 sponsorships from ATA member firms and other trucking related businesses and stakeholders and hosted 320 golfers who filled all three courses at the RTJ Capitol Hill. Vertical Alliance Group served as the Presidential Sponsor of the 2018 Classic donating $15,000. Organizers said that donation helped spur a record amount of sponsorship revenue and served as a catalyst for increased membership participation this year. In addition to that, there were 17 firms that contributed $5,000, or more, including ATA Comp Fund; B.R. Williams Trucking; Birmingham Freightliner; Boyd Bros. Transportation; Buddy Moore Trucking; Church Transportation & Logistics; Davison Fuels & Oil; Fitzgerald Peterbilt; Gulf City Body & Trailer Works; Greenbush Logistics; J & M Tank Lines; Marmon Highway Technologies; McLeod Software; Southland International Trucks; Truckworx; Watkins Trucking Co.; and Wiley Sanders Truck Lines. Balanis also thanked his ATA Golf Classic Finance Committee for its hard work. Committee members included, Will Bruser, Truckworx; Fenn Church, Church Transportation & Logistics; Mark Coffman, Coffman International; Wesley Dunn, RangeWay Carriers; Andrew Linn, Southland International Trucks; Bill Waechter, Gulf City Body & Trailer Works; Wayne Watkins, Watkins Trucking Co.; Taylor White, Alabama Motor Express; and Daniel Wright, Wright Transportation.